City of Malolos - The entire province of Bulacan is in mourning because of the sudden demise of Board Member Ernesto S. Sulit of the Third District who succumbed to lung cancer and breathed his last while confined at a hospital in Cabanatuan City, Nueva Ecija last May 14, 2014. A necrological service was held on May 21, 2014 to pay tribute to the deceased legislator at the Resthouse of the Sulit Family in Barangay Bulualto, San Miguel, Bulacan. Provincial officials, led by Governor Wilhelmino M. Sy-Alvarado and Vice-Governor Daniel R. Fernando, attended the service and delivered their respective messages. After the necrological service a mass service followed. His remains was laid to rest at the San Miguel Memorial Park located in Balite, San Miguel, Bulacan. 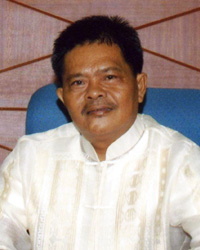 BM Sulit, considered as one of the most experienced legislators of the present 8th Sangguniang Panlalawigan, was born on March 26, 1954 in Bulualto, San Miguel, Bulacan. He graduated valedictorian at the Bulualto Elem. School, San Miguel, Bulacan in 1971 and was an outstanding student during his high school days. He finished his Bachelor of Science in Foreign Service at the Lyceum of the Philippines in 1975. He began his political career in 1992 when he was elected councilor of the Municipality of San Miguel. He was reelected in the succeeding elections in 1995 and 1998. In 1998, he became an ex-officio member of the Sangguniang Panlalawigan when he was elected as president of the Philippine League of Councilors (PCL)-Bulacan Chapter. In the 2001 election, he lost when he ran as board member. In the 2004 election, he was eventually elected as board member of the third district to serve the province as a full-fledged board member. He was reelected in 2007. In the 2011 election, he returned to his hometown and was again elected councilor of San Miguel. In 2013 election, he ran again as board member of the third district and won to be able to return to the Sangguniang Panlalawigan. He chaired the Committee on Agriculture and Fisheries, Committee on Agrarian Reform and the Committee on Tourism, Culture and the Arts until his death. BM Erning was the first and original host/anchor, together with former SP Secretary Alice Javier, of the Sangguniang Panlalawigan’s long running radio program “SP Files” which was first aired at Radio Bulacan 100 mhz.fm on January 29, 2001. The radio station was located at the Bulacan National State College in San Ildefonso, Bulacan. Board Member Sulit was survived by his wife Emerlinda and three daughters Norinyl, Noriday and Jenille.